Portrait of Empress Shoken (昭憲皇后, Shoken Kogo, 1849–1914), consort of Emperor Meiji. Born as Masako Ichijo (一条勝子), she adopted the given name Haruko (美子) when she became engaged to Emperor Meiji on September 2, 1867 (Keio 2). Her name was posthumously changed to Empress Shoken. Photographed by Kuichi Uchida (1844-1875) in 1872 (Meiji 5). 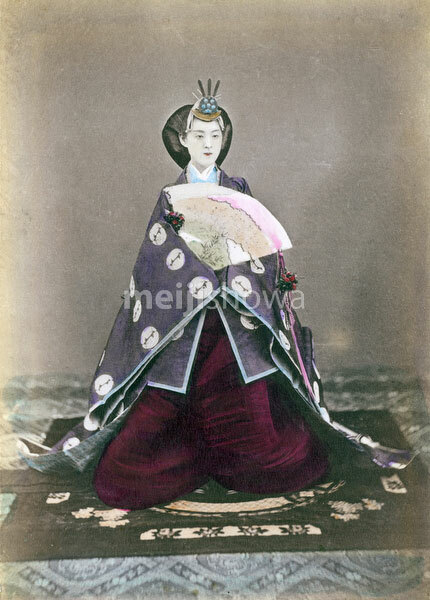 Uchida was the first photographer allowed to photograph the Meiji Emperor and Empress. The Emperor was not photographed again until 1889 (Meiji 22).